Melanie and Michele met Tammy in college, at Chico State, and there started their friendship and love for craft beer. Since their time at Chico, they’ve remained good friends and traveled together and separately all over the world. From Europe, to Asia, to South Africa, they’ve enjoyed all kinds of beer sparking the desire to open their own brewery. The three put roots down in downtown Bend 14 years ago, knowing Bend was a great place to live and a hotbed for craft breweries. Their garage, named “Spider City,” spawned the decision to open their own brewery, with them initially brewing in “Spider City” in the hot summer months. 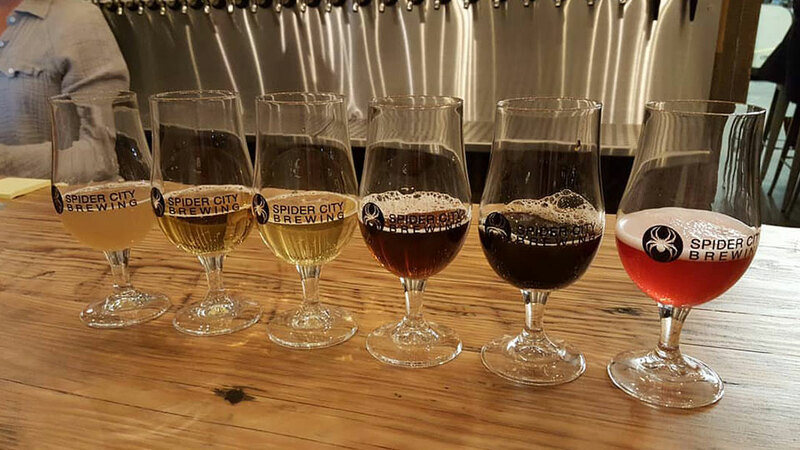 With fun times and high spirits the story behind the name Spider City Brewing was launched. They love good, clean beer and how beer brings people together. From their travels, they want to bring interesting beers to Bend. While they love a great IPA, they also want to bring a variety of different beers to the beer lover because really, it’s all about the beer! Tuesday – Thursday | 2:00 p.m. – 9:00 p.m.
Friday – Saturday | 2:00 p.m. – 11:00 p.m.
Sunday | 2:00 p.m. – 8:00 p.m.